Summary: Equipment and supplies are being purchased to enhance The Turtle Hospitals ability to hold sea turtles in quarantine / isolation in a controlled environment. 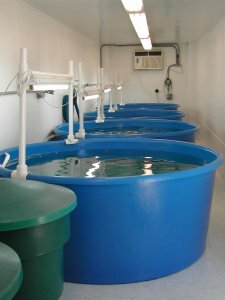 This facility is required for conducting fibropapillomatosis transmission studies, which have been a research focus of the Hidden Harbor Marine Environmental Project for over 10 years, and which continue to contribute to our understanding of this important disease in Florida sea turtle populations. The facility will utilize recirculating artificial seawater in a controlled temperature room. Equipment for long-term monitoring and recording of daily water temperature fluctuations and pH will provide valuable documentation of the functioning of this facilitys control systems and critical data for examining the effects of temperature on disease progression, treatment efficacy, healing, and recovery times. Brochures about sea turtles and The Turtle Hospital help our education program by allowing the public, especially local school children, to learn more about sea turtles, the problems they face and what The Turtle Hospital does to help sea turtles survive.